This is going to be a really quick write up with mostly fun photos of my first Moss skirt by Grainline Studio. This skirt went together so easily it made me tear up a bit. I cut a size smaller for the hip of the skirt because as I often say I have no rumpus. The size blending went really smoothly, even blending the waistband and all the pieces. It was like Jen did it for me herself. I used a black twill I’ve bought a while ago. I actually bought about 8 yards of it because I know how much I make things in black and if it doesn’t go so well you can’t tell. ha! 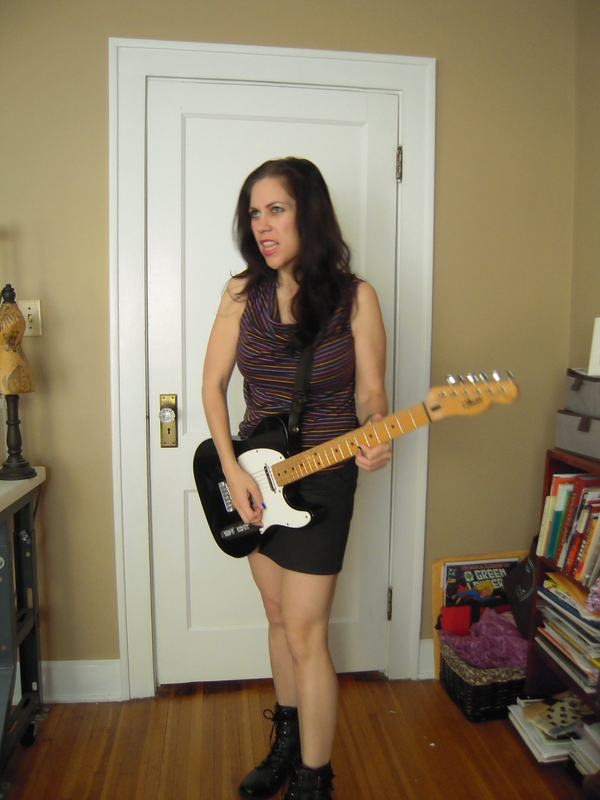 Oh and because it’s the Grunge Sew-along, I thought I’d play that up. But first, the front, side, back pics. 🙂 I didn’t wear tights, though it’s certainly cold enough for them, because I wanted you to see the actual length. I thought it was going to be too short but it’s not. Thanks to Kirsty and Jen for encouraging me to make this! I’ve been wearing it a lot. The top is Maria Denmark’s day to night top. I made it months ago and never blogged about it. It’s out of a wool jersey and just toasty enough. So, below I give you a standard back garment shot and what I’ll call my album cover shot. I had fun taking these pics. This weekend I’m off to Canada to visit Gillian and I get to meet some of the sewcialists that live in and near Toronto. I’m hoping to pick up some fabric, hang out and over all just enjoy the ride! Cute skirt (and top). Love your album covers. It sounds like you have great weekend plans too. I’m just feeling so lucky right now. So lucky. Nailing the grunge theme here but an entirely versatile skirt! It truly is versatile. Thank you. Hooray for versatile black clothing even if they don’t photo well. You are still the prop queen! Prop queen? OMG. I love that! You are so awesome to me. love the moss! i’ve made it many times myself, such a great pattern! I’m so slow catching up with some patterns. Haha. It really is a great pattern! Oh you guys are going to have so much fun! I can’t wait! Sorry I can’t meet you, too! Thanks lovely! I’ll totally send you a copy. I love the skirt! Way too short for me, but you look fantabulous in it! Especially rockin’ that guitar. 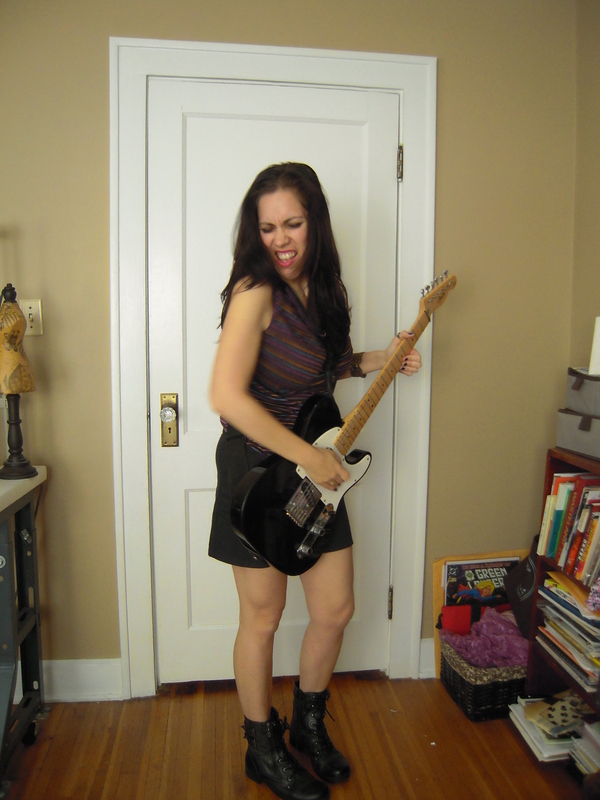 I keep trying, especially since inheriting my Dad’s guitar, but I just can’t pick it up. I gifted the guitar to my brother, who has had much more success learning.